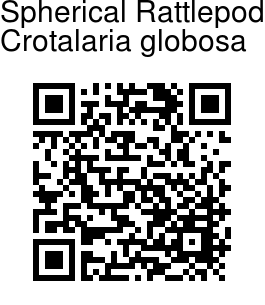 Spherical Rattlepod is a prostrate herb with branchlets round, much branched, silky-hairy. Leaves are simple, alternate, leaf-stalks 1-2 mm long. Leaf blade is ovate-round, 0.6-2 x 0.6-2 cm, papery, densely hairy beneath, sparsely hairy above, somewhat heart-shaped or sometimes rounded basally, blunt at tip with a small point. Lateral nerves are 3-4 pairs. Flowers are borne in a 1-3-flowered raceme. Flower-cluster-stalk 1-4 cm long, hairy. Flowers are about 1.5 cm across; flower-stalks 2-5 mm long; bracts bristly, 1-2 mm long; bracteoles minute, above the middle of the flower-stalk. Calyx tube 3-5 mm long; sepals 5, lanceshaped, 5-7 mm long, densely hairy, upper 2 basally fused, longer than the lower 3. 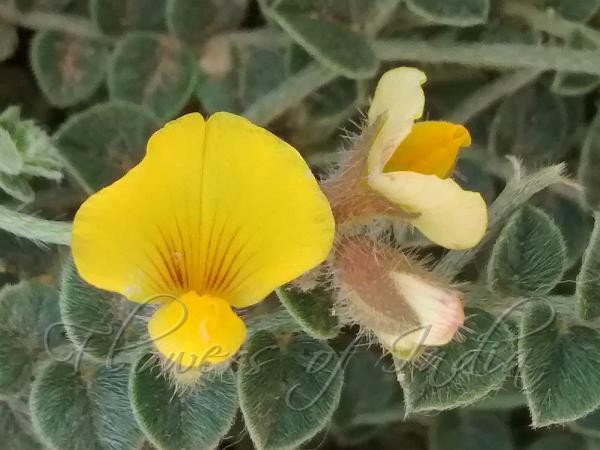 Flowers are pea-shaped, yellow, exerted; vexillum ovate-round, about 7 mm long, prominently veined with a short, curved claw, becoming orange with age; wing petals oblong, 56 mm long, becoming reddish with age; keel petals slightly swollen with a short twisted beak, 57 mm long, becoming reddish with age. Stamens 10, monadelphous, dimorphic; staminal sheath about 3.5 mm long; filaments 34 mm long; anthers dimorphic with longer anthers oblong, 1 mm long, shorter anthers ovoid, 0.5 mm long. Pods are spherical, 5-8 mm across, brown, stalkless, turgid, short, stiff, white- hairy. Seeds 3-5, ovoid or somewhat kidney-shaped, 2 mm across, yellowish-brown obscurely striped. Spherical Rattlepod is endemic to Tamil Nadu. Flowering: November-December.